California Governor Arnold Schwarzenegger is establishing by Executive Order a Low Carbon Fuel Standard (LCFS) that requires, as an initial goal, a 10% reduction in the greenhouse gas emissions (GHG) intensity of all passenger vehicle fuels sold in California by 2020. The LCFS requires fuel providers—refiners, importers, and blenders of passenger vehicle fuels—to ensure that the mix of fuel they sell into the California market meets, on average, a declining standard for GHG emissions measured in CO2-equivalent gram per British Thermal Unit (BTU). All relevant greenhouse gases will be included (i.e., CO2, CH4, and N2O) and be measured on a full fuel cycle basis (i.e., upstream feedstock extraction, fuel refining, and transport to market [or well-to-pump stages]). The LCFS is the world’s first fuel standard targeted specifically at the quantified reduction of greenhouse gas emissions, measured on a full lifecycle basis. "Transportation accounts for forty percent of California’s annual greenhouse gas emissions, and we rely on petroleum-based fuels for an overwhelming 96 percent of our transportation needs. This petroleum dependency contributes to climate change and leaves workers, businesses and consumers vulnerable to price shocks from an unstable global energy market. As a world leader in energy efficiency, alternative energy and reducing greenhouse gases, California’s new low carbon standard is an innovative action that will diversify our fuel supplies and establish a vibrant market for cleaner-burning fuels." [The LCFS] is expected to replace 20% of on-road gasoline consumption with lower-carbon fuels, more than triple the size of the state’s renewable fuels market, and place more than 7 million alternative fuel or hybrid vehicles on California’s roads (20 times more than on the California roads today). The LCFS will use market-based mechanisms that allow providers to choose how they reduce emissions while responding to consumer demand. For example, providers may purchase and blend more lower-carbon ethanol (e.g., cellulosic ethanol rather than corn ethanol) into gasoline products, purchase credits from electric utilities supplying low-carbon electrons to electric passenger vehicles, diversify into low-carbon hydrogen as a product and more, including new strategies yet to be developed. 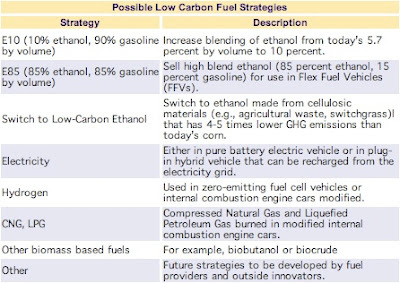 "While at this time we believe the most likely strategies are E10, E85, switching to cellulosic ethanol, plug-in hybrids, and hydrogen fuel cells, markets will determine whether that mix or others (including options such as biobutanol or biocrude) will be employed to meet the standard." Large-scale use of lower-carbon transportation fuels is necessary to meet the AB32 requirement that GHGs generated in the state be reduced to 1990 levels by 2020. A 10% reduction in the carbon intensity of transportation fuels will contribute 13.4 million metric tons of CO2 reductions, more than half of the 24 million metric tons of CO2 reductions needed to return passenger vehicles and light trucks to 1990 levels. The Governor’s Executive Order directs the Secretary for Environmental Protection to coordinate the actions of the California Energy Commission (CEC), the California Air Resources Board (ARB), the University of California and other agencies to develop the protocols for measuring the “life-cycle carbon intensity” of transportation fuels. This analysis will become part of the State Implementation Plan for alternative fuels as required by AB 1007 (Pavley, Chapter 371, 2005) and will be submitted to the California Air Resources Board for consideration as an early action item under AB 32. The ARB will complete its review of the LCFS protocols for adoption as an early action no later than June, 2007. Upon adoption as an early action by the ARB, the regulatory process at ARB will begin to put the new standard into effect. It is expected that the regulatory process at ARB to implement the new standard will be completed no later than December, 2008. The University of California estimates that the Governor’s greenhouse gas (GHG) emissions goals can increase Gross State Product by about $60 billion and create more than 20,000 new jobs. Yet another innovative policy designed to reduce greenhouse gas emissions to come out of California. I remember when Schwarzenegger was first elected and most of the world, including myself, laughed that Californians would elect the Terminator to lead the 8th largest economy in the world. Little did we know, the Governator would not only be an effective governor, but would also become the most aggressive and visible leader on climate change policy in the United States. California's growing collection of policies designed to reduce the state's carbon emissions presents a much-needed model of what can be - and most desperately needs to be - done at a national level to combat global warming. Mr. Bush, are you paying attention? I was surprised that the article didn't mention anything about how this policy would interact with the carbon emissions standards that are part of California's stricter auto emissions standards. I would assume that lower carbon content fuels would simply make it easier for automakers to meet the carbon emissions standards (i.e., their vehicles would not have to be quite as fuel-efficient in order to meet the carbon emissions standards). In other words, I would assume that the Low Carbon Fuel Standard and the carbon auto emissions standards are complamentary, and not additive - that is, the auto emissions standard will still be the ultimate driver of GHG reductions from the light duty vehicle fleet in California, and the new LCFS will help reach those emissions targets (shifting some of the burden from automakers to the fuel industry). Both of these policies focused on emissions from the transportation sector will help California meet the overall emissions reductions targets set by AB 32. As a side note, because the LCFS does shift part of the burden for meeting the vehicle emissions standards from the auto industry to the fuels industry, it will probably help undercut the auto industry's legal assualt on the California Vehicle Emissions Standards (now adopted by several other states across the country). California is the best guinea pig this country could have. Only when these policies succeed at the state level will we begin to consider national policy. CA is pushing the envelope not just within their own borders, but on the federal level as well. And when other states, and finally the nation as a whole realize that this is our future and the longer we resist, the more it will hurt us, economically and environmentally, CA will be so far and away ahead of the pack that their political and economic sway will dwarf the rest of ours. Anyone up for moving to CA? I had my doubts about the Governator as well. Good analysis at the end of this piece. I enjoyed it. I suspect this is at least partly a hedge against the likely Supreme Court ruling (this coming summer) that the EPA cannot regulate carbon dioxide as a pollutant. If CO2 is not a pollutant under the Clean Air Act, I suspect the courts will quickly through out several of the California initiatives. This one should survive that though. That's an interesting analysis, Shadoweyes, and is certainly plausable. Which of their intiatives do you think are at risk of being overturned by the Supreme Court ruling (assuming it goes badly)? I definitely agree, Jenny, that California's efforts to address CO2 emissions and global warming will position the state, and the businesses and industries that operate there, far out in front of the pack when the inevitable finally happens: national carbon regulations. In the carbon constrained future that is coming, California will have an excellent competitive advantage, and the longer the rest of the US waits, the farther behind California and much of the rest of the world (Germany, the UK, Japan, etc.) we will be when we finally get in the game. The Federal District Court hearing the auto iundustry challenge to California's tailpipe GHG regulations (resulting from the Pavley bill) has suspended the regs pending the US Supreme's decision on the Massachusetts v US case as to whether GHGs are a pollutant that can be regulated under the Clean Air Act. If the Supremes find that it is, the regs can only go live if CA gets a waiver from the federal government. The Governor's Low Carbon Fuel Standard was definitely a "belt and suspenders" approach because it seemed possible the other regs might get nixed by the Fed courts through a pre-emtion challenge.